Hatsune Miku Has Her Own Store in Japan. It's Not Virtual! 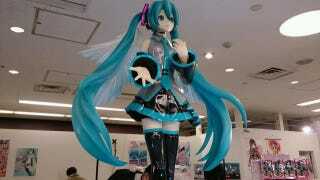 Virtual idol Hatsune Miku might not be real, but her popularity sure is. In Japan, the character, who stars in own line of Sega music games, now also has her own store. Called "Miku Wing Shop," the store will be opened for a limited time only at Haneda Airport in Tokyo. The name "Wing Shop" is actually a pun. In Japanese, Haneda is "羽田," with the character "hane" (羽) meaning "wing." You know, airplanes and all. The Miku shop, reports IT Media, will end its flight on March 31. Its memory will live on!